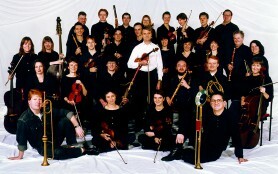 Collegium Musicum 90, founded by Simon Standage and Richard Hickox, has a well-established reputation for the performance of Baroque and Classical music, with repertory ranging from chamber pieces to large-scale works for choir and orchestra. Highly acclaimed for its performances and recordings, it has made more than 60 CDs under its exclusive contract with Chandos Records. Highlights of recent seasons have included appearances at the BBC Promenade concerts and concerts at music festivals in Poland, Hungary, Germany and Austria. Performances by the Collegium Musicum 90 chamber ensemble in the UK, Germany and Poland have also been enthusiastically received. Recordings with Simon Standage as director and violin soloist include all the violin concertos of Bach as well as those of Jean-Marie Leclair, and orchestral music by Handel, Albinoni, Torelli, Vivaldi, Arne and Stanley. A series of discs of Telemann suites and concertos have championed the composer’s cause and in recognition of this promotion of his music Simon Standage was awarded the Georg Philipp Telemann Prize for 2010 by the City of Magdeburg. Simon Standage is well-known as a violinist specialising in seventeenth and eighteenth century music. After reading music at Cambridge University he joined the Netherlands Chamber Orchestra under Szymon Goldberg before receiving a Harkness Fellowship to study violin with Ivan Galamian in New York. On his return to England he played with the London Symphony Orchestra and the English Chamber Orchestra of which he was sub-leader for four years. Leader and soloist with The English Concert from its foundation in 1973 until 1990, he also fulfilled the same role for many years with the City of London Sinfonia. As well as the many records he made with The English Concert (including Vivaldi’s The Four Seasons, nominated for a Grammy award), he also recorded solo and chamber music – including all of Mozart’s violin concertos – with the Academy of Ancient Music, of which he was, with Christopher Hogwood, Associate Director from 1991 to 1995. Since his foundation, with Richard Hickox, of Collegium Musicum 90, he has made numerous recordings for Chandos Records, which have met with consistent critical acclaim. As soloist and director of chamber orchestras and chamber musician, he is active both in Britain and abroad, where he has had for some years a regular collaboration with Collegium Musicum Telemann in Osaka and Haydn Sinfonietta in Vienna. He is leader of the Salomon String Quartet (founded by him in 1981), which specialises in historical performance of the Classical repertoire, performing worldwide and making many recordings and broadcasts. He is Professor of Baroque Violin at the Royal Academy of Music in London, and teaches at summer courses in Europe. In 2008 he received a medal for services to Polish Culture, in 2009 he was awarded Honorary Membership of the Royal Academy of Music and in 2010 he was the recipient of the Georg Philipp Telemann Prize, awarded by the city of Magdeburg.